In life and in death, slaves were commodities, their monetary value assigned based on their age, gender, health, and the demands of the market. 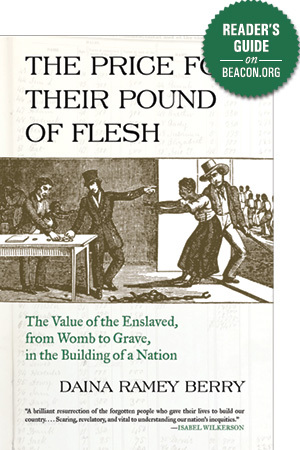 The Price for Their Pound of Flesh is the first book to explore the economic value of enslaved people through every phase of their lives—including preconception, infancy, childhood, adolescence, adulthood, the senior years, and death—in the early American domestic slave trade. Covering the full “life cycle,” historian Daina Ramey Berry shows the lengths to which enslavers would go to maximize profits and protect their investments. Illuminating “ghost values” or the prices placed on dead enslaved people, Berry explores the little-known domestic cadaver trade and traces the illicit sales of dead bodies to medical schools. This book is the culmination of more than ten years of Berry’s exhaustive research on enslaved values, drawing on data unearthed from sources such as slave-trading records, insurance policies, cemetery records, and life insurance policies. Writing with sensitivity and depth, she resurrects the voices of the enslaved and provides a rare window into enslaved peoples’ experiences and thoughts, revealing how enslaved people recalled and responded to being appraised, bartered, and sold throughout the course of their lives. Reaching out from these pages, they compel the reader to bear witness to their stories, to see them as human beings, not merely commodities. A profoundly humane look at an inhumane institution, The Price for Their Pound of Flesh will have a major impact how we think about slavery, reparations, capitalism, nineteenth-century medical education, and the value of life and death. In her book, Daina Berry charts the ways enslaved people recalled and responded to their monetary value throughout the course of their lives. “Enslaved people were valued in life and in death,” she writes in the introduction. “But because they were people and property, multiple sets of values encompassed them and were placed on their bodies” (6). Berry defines three kinds of value. Discuss these three kinds of value and what they mean. At the beginning of chapter 1, Daina Berry tells the story of enslaved woman Adeline and her ten-week-old son, writing that her son was “living proof that she was a child-bearing woman” (10). Using this narrative as a jumping-off point, discuss how enslaved women were valued. What are the larger implications of this in terms of reproduction, women’s bodies, and the life cycle of a particular enslaved person? Berry describes her book as an “intellectual history of enslaved people’s thoughts, expressions, feelings, and reactions to their own commodification” (2). In chapter 2, Berry looks at how enslaved children were valued. Discuss an enslaved person’s monetary value early in his or her life. How did an enslaved person’s awareness of his or her monetary value change over the course of his or her life? In chapter 3, Berry tells the story of adolescent enslaved girl Celia and her sexually abusive owner, Robert Newsome. Acting in self-defense, Celia killed Newsome and disposed of his body by burning him in her cabin. Regarding these events, Berry writes, “As this book unfolds, Celia’s act will take on multiple meanings, some perhaps connected to the history of medicine” (82). Discuss how you see Celia’s actions after reading the book. Nat Turner is most commonly remembered for his involvement in one of the largest slave uprisings in US history, in 1831. In chapter 4, Berry provides a window into what happened to Turner’s body after his execution. Discuss the story of Turner’s remains and how this sheds light on postmortem commodification. In chapter 5, Berry illuminates the valuation of enslaved elderly individuals. Discuss how the external value and soul value of enslaved people changed as they entered old age. At the beginning of chapter 6, Berry details the public autopsy of a deceased elderly enslaved woman named Joice Heth. As Berry makes clear, infamous showman P. T. Barnum “had made a great deal of money off Heth when she was alive and even managed to collect fees for her very public display after she died” (149). Using this particular story as an example, discuss what happened to enslaved people after death. Who acquired the cadavers of formerly enslaved people, and how were those cadavers used? What do you think this usage illuminates about modern medicine? In a 2016 New York Times op-ed article, Daina Berry revealed that in October of 2016 researchers finally delivered what are believed to be the remains of Nat Turner to his descendants. At the end of that article, Berry writes, “Returning these body parts to descendants, or at least granting them a respectful burial, will help our nation heal from the sin of slavery and its ugly afterlife.” What does Berry’s book reveal about how enslaved people thought of the grave as a site of burial? Why is a proper burial so important? Does Berry’s book change your personal view of burial practices? In her preface, Berry describes the current moment as “the historic spectacle of black death” (xiii). How does Berry’s book help you think about current racial violence and the response of Black Lives Matter? What do you think Berry means by “Black Bodies Matter”? In her epilogue, Berry writes, “Despite being traded as commodities from the womb to the grave, enslaved people’s understanding of their soul values transcended the external values placed upon their bodies” (197). Discuss where you see the persistence of soul value in the book.